Fate is a wonderful thing sometimes. I dreamed about making bikes since my childhood but never understood the concept of custom bicycles. I went to school for Mechanical Engineering so I could design bikes and possibly go work at Cannondale in Connecticut. After school I quickly realized that 10 years of bike shop wrenching experience and an engineering degree wasn’t enough to get into the bike manufacturing business. Fast forward to 2002 when I learned that there was a custom frame builder in my home town of Providence, RI right down the street from my house. I warmed up to Chris pretty quickly and had him build me a couple of frames over a two year period. It was about 200 cups of coffee later that I convinced him to let me apprentice with him. Now that I’ve been working here for almost 9 years, I can see how this might’ve been perceived. My idea of frame building from a customer’s perspective was highly romanticized and unrealistic. But Chris took me on and challenged me to learn all the facets of the process because that’s how it works at this shop. The builder needs to tackle the learning curves of fitting, materials, brazing, metalworking, and painting. After a year of doing small repairs and paint jobs, I built my first frame in 2005 and I was off. I quit my “real” job in 2007 and have been building and painting full-time since. There is no way my life would be on this path without Chris Bull. He is the reason I am a frame builder today and it is so much of who I am. That’s why I’m saddened to leave this shop. The rapport that we have developed over these years has been one that I cherish. We are like brothers who love and irritate each other and finish each other’s Simpsons quotes. 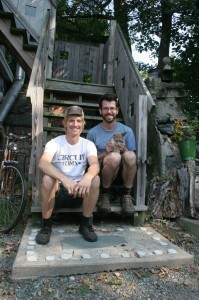 In 2010 I approached Chris with the desire to build some bikes under my own name—Chapman Cycles. The reason being that I wanted to try and create a brand of bicycle that was specific in style and focused on commuting, light touring, and city bikes (bikes with which I identify most). I built bikes for my family and friends and it was a fun side project for a couple of years. But the list has been growing and the time to part ways with Circle A Cycles is coming to a head. I am not severing ties or burning any bridges with Circle A. I still consider Chris and Jay (our painter and soon to be builder) not as co-workers but as two of my closest friends. I will still be working at the shop finishing up paint work and frames for customers on my Circle A list. I wish the best for Circle A Cycles and I look forward to seeing Chris and Jay continue to make some of the best bloody bikes on the planet!